This heavy duty trough provides water for wildlife, domestic animals and bats. It’s also suitable for use in “Wildlife Partner Programs”. Our trough includes a built-in escape ramp, with aggressive traction surface to give small animals an easy exit. A large 10″ hatch provides easy inspection of the protected float-valve system under ramp. Note: Escape ramp is designed for small animals only and should not be used by large animals to enter or exit trough. The Trough-250 can be installed in-ground if it is properly framed-in with cement block to provide proper support. Please see the plans provided below for an example. The Trough-250 weights in at 160 lbs. Top and bottom separate which allows you to nest and ship multiple units. Assembly is simple with 8 stainless steel bolts. Rainmaker products are made of durable polyethylene. It’s impervious to freezing and UV tolerant. This trough includes double walled construction and has a .22″ wall thickness. It has an overlapping lid and large gussets for strength. Please note that you may see a little side wall deflection due to the 8 ft length and water pressure. This is normal. The float-valve system is protected under the escape ramp and can be accessed through the hatch. The valve is made of PVC and stainless steel to minimize calcification and mineralization issues. The float Valve system includes a stainless steel chain and rod, and a polyethylene float. 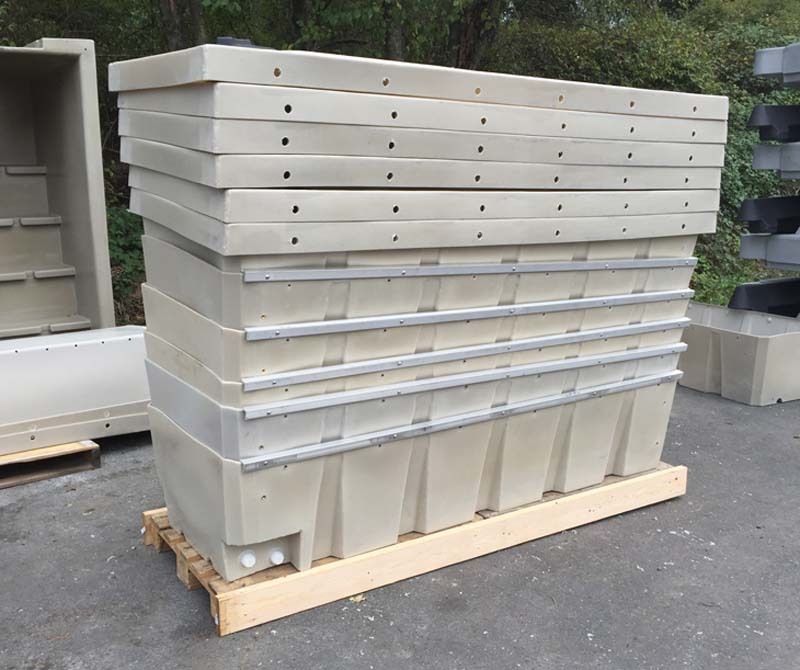 Troughs “nest” together to reduce shipping cost. Up to 6 units can fit on one pallet for easy shipping.